For most women, the ‘dream dress’ is arguably the single most important facet of their wedding day imagery. Although the perfect gown is the focal point of every bride’s unique wedding day look, complementary earrings—whether simple studs or dazzling dangles—are the finishing touch that will ultimately complete it. Whether you’re a bride-to-be or you have a loved one preparing for her special day, don’t underestimate the fashion impact of the right bridal earrings. They should gracefully frame the woman’s face, and perfectly complement every element of her bridal look. And most importantly, they should be a unique expression of her personality and style. There are many different styles of bridal earrings, ranging from classic and understated to bold statement pieces. Pearl studs are a traditional choice for brides, as are drop-style earrings featuring larger or uniquely-shaped pearls accented with diamonds. 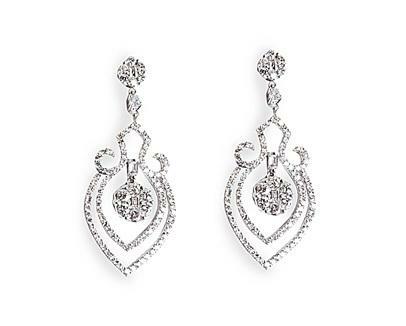 For an on-trend look and the maximum in eye-catching sparkle, consider glittery ‘chandelier’ earrings. You might choose to include one or more precious gemstones for a touch of color, such as sapphires for your ‘something blue’. Or, you may opt for the timeless simplicity of diamond studs. Is the wedding fairy-tale romantic, fancy and opulent, or comfortably casual? Whatever the wedding-day ambiance and ‘feel’ may be, the bride’s look should complement it. Consider the bride’s hairstyle, dress style, make-up, and other jewelry as well, to create earrings that uniquely enhance the overall image. There are few more important occasions in a woman’s life than her wedding day. Above all others, that is the day when she wants to look and feel her most beautiful. If you can’t seem to find ‘just right’ earrings to complete your vision, consider working with one of our experienced designers to create a custom pair. The jewelry professionals at Dominion Jewelers have the expertise to guide you in creating beautiful bridal earrings that capture your imagination—and are destined to become a treasured heirloom for generations. We invite you to contact us to learn more about custom designing the perfect bridal earrings, or plan a visit to our beautiful showroom in Falls Church, Virginia to browse our extensive collection.